"My Quantum Power Chair is fast! I don’t need someone to help me over long distances or up hills." When it comes to sports, 10-year old Max Malec plays hard. Although he was born with spina bifida, Max is extremely active. And with his Q6 Edge® 2.0 Power Chair with iLevel®, Max enjoys greater independence while doing the things he loves. For Max Malec, playing his heart out is the only option. At just 10 years old, Max is an experienced athlete who gives it his all despite his disability. Born with spina bifida, Max is paralyzed from the waist down. He lives in Roaring Brook Township, Pennsylvania, with his dad and older brother, Mickey. 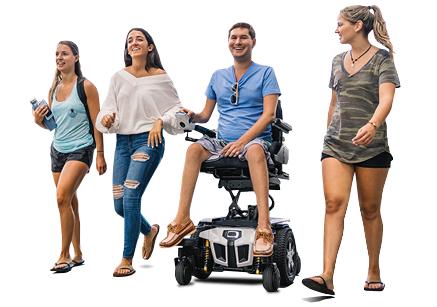 To get around, Max uses the Q6 Edge® 2.0 Power Chair with iLevel®. “My Quantum Power Chair is fast! I don’t need someone to help me over long distances or up hills,” Max said. With his iLevel, Max can reach things in the refrigerator or the upper cabinets. Plus, when elevated, Max is as tall as his brother. Max is a diehard football fan and roots for the Pittsburgh Steelers and Penn State Nittany Lions. He plays football for the North Pocono Junior Trojans. His first tackle was a sack on the quarterback against Lakeland two years ago. Besides football, Max plays baseball and soccer on the Lackawanna County Challenger League team. He also loves basketball and swimming. When Max isn’t busy playing sports, he and his dad participate in 5k and 10k races. 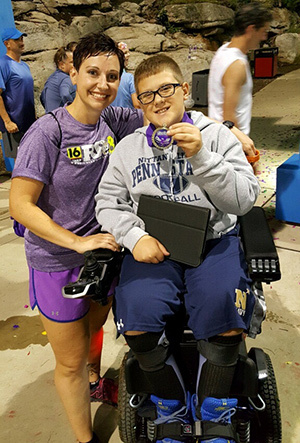 In the fall of 2016, Max completed his first 5k race for WNEP’s Ryan’s Run and 5k & All Abilities Walk in Scranton. In the summer, Max attends a camp for kids who have spina bifida. “I get to do a lot of neat things with other kids like me,” Max said. With so many interests, Max has no problem staying active. His love for sports, especially football, has Max looking towards the future. One day, he hopes to be a professional football player.